It’s the day before the 2018 Macy’s Thanksgiving Parade, the 92nd version in the history of the event. Balloon inflation began at noon on 77th Street and 81st streets around the American Museum of Natural History and the New-York Historical Society, and we went behind the scenes to check it out. This year, there will be 16 giant helium balloons and 43 novelty or ornament balloons, along with “balloonicles,” the hybrid ballon and vehicle that Macy’s invented. New balloons this year include the elf stars from Netflix’s “The Christmas Chronicles,” (the first balloons by the streaming video service), the anime star Goku from Dragon Ball Super: Brokly, LittleCloud by FriendsWithYou from the Paradise Blue Sky Gallery series, the Go Bowling pins and bowling ball balloonicles, Sinclair’s Baby Dino balloonicles, and the astronaut star of Macy’s Christmas celebrations, Sunny the Snowpal, also featured in the Macy’s holiday windows this year. Fan favorites returning include Charlie Brown, SpongeBob SquarePants, Pikachu, Pillsbury Doughboy, Olaf from Disney’s Frozen, Sinclair’s DINO, Ronald McDonald, Toothless from “How to Train Your Dragon,” Dreamworks’ Trolls, The Grinch, and more. Each balloon has a board mounted onto wood posts with detailed inflation instructions, along with an image on how the balloon should face when it is inflated. The helium is supplied from trucks by Linde (Macy’s is the second largest consumer of helium in the world! ), and teams collectively inflate the balloons. The giant balloons are inflated, tethered and then anchored to Toro Workman vehicles in prep for tomorrow’s parade. The public is invited to check out the balloon inflation behind NYPD barriers until 8 PM today. The parade begins tomorrow 9 AM tomorrow and is broadcast on NBC. 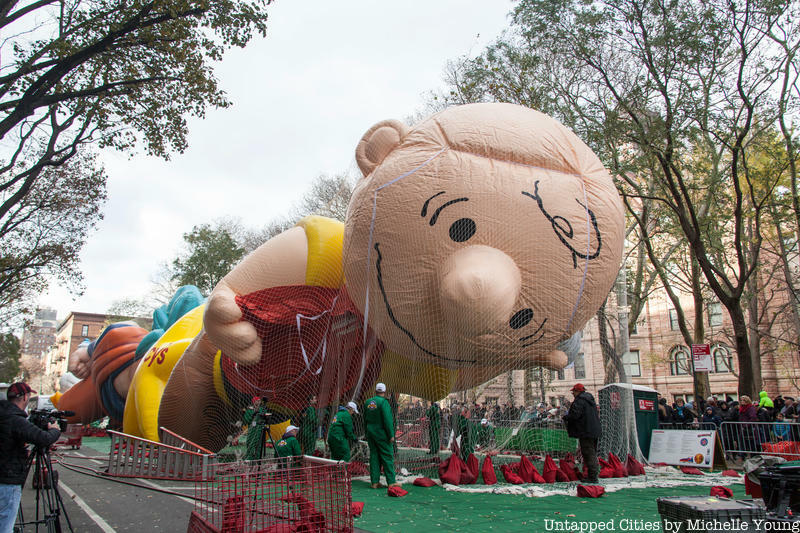 Next, check out 10 Balloon Mishaps at the Macy’s Thanksgiving Parade and the Top 10 Secrets of the Macy’s Thanksgiving Parade.